1. Show a list of all employee names and their department names and the employees for each department. Be sure to show all departments whether there is an employee in the department or not. Use an outer join. 2. Select all employee names and their department names. Be sure to show all employees whether they are assigned to a department or not. Use an outer join. 3. Write a query that that performs an inner join of the grade, student, and grade_type tables using ANSI SQL 99 syntax. 4. 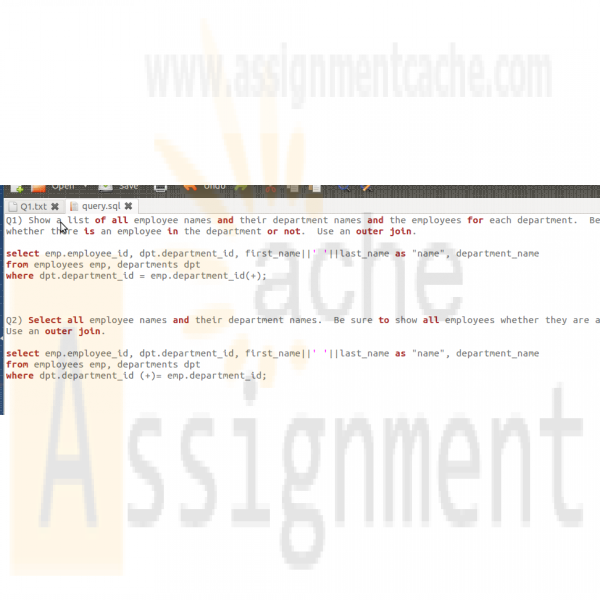 Write a query that that performs an inner join of inner join of the grade, student, and grade_type tables using the Oracle inner join convention. 5. List all the zip codes in the ZIPCODE table that are not used in the STUDENT or INSTRUCTOR tables. Use a set operator. 6. Write a SQL statement using a set operator to show which students enrolled in a section that are not enrolled in any classes. Exclude students with student id less than 300.